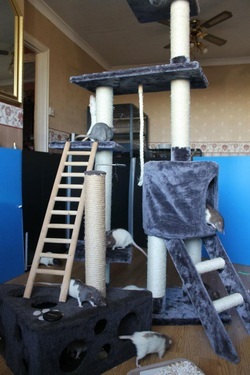 My rats are currently housed in a triple level Liberta Explorer, a double level Savic Royal Suite with an added Liberta Explorer section on top, and a double explorer. 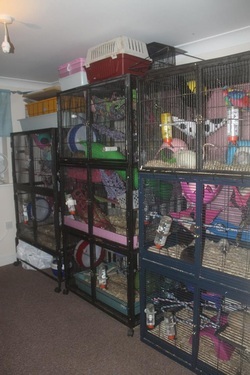 My rats have a designated room at my home, once babies have opened their eyes they move into the lounge to be in the heart of the home where they are exposed to music, talking, television and vacuum cleaners for example. I try to provide interesting challenging layouts for my rats encouraging them to leap, jump and climb. The majority of my cages have the largest size Silent Spinner wheels, and all the toys are rotated for variety. Litters will be born in either a Ferplast Mary or Savic Ruffy. I prefer these to tanks as they provide better ventilation for both Mum and babies. Once the babies are 3 weeks old they will move to either a Ferplast Furet Plus or a Savic Freddy 2 which with a careful layout so the babies can explore and play with toys. I have a large playpen for my rats made out of corrugated plastic sheets, due to having larger groups I have found this the easiest option to be able to provide decent quality free range time with enrichment and stimulation. My rats come out daily and If I am unable to let them out in the playpen then they will either spend one to one time with me on my bed, or on the sofa. I have a large range of toys for free range time including tunnels, wine racks, boxes, igloos, wooden toys, paper sacks and two smaller cat stands. Their favorite toys appear to be a 5 foot cat stand or myself! My rats are fed on a diet which I make up myself. The base of my mix consists of Harrisons Banana Brunch and a ready made base mix from Rat Rations. I then add a selection of cereals, pasta, dog kibble, dried fish/shrimps, dried mixed vegetables, herbs, garlic and kelp. My mix varies from each batch I make to add variety although the same proportions of staple food groups are kept to ensure overall health of my rats is always at it's best. I monitor the health and well-being of my rats closely and have found them to do well on this diet. My rats regularly get fresh fruit and vegetables alongside 'Dr Squiggles' and 'Daily Rat 3' for nutritional support. Mums and babies will have a separate mix with added protein/fat in to aid growth. Kittens will leave me with a sample of their current food, and I'll always be happy to sell owners my dry mix if so desired. My rats are not denied of any veterinary treatment if they need it and I have access to a surgery 24 hours a day, whom I have a good relationship with. I currently use Harleigh Vets in Bodmin, and I would recommend this practice to anyone in my area.